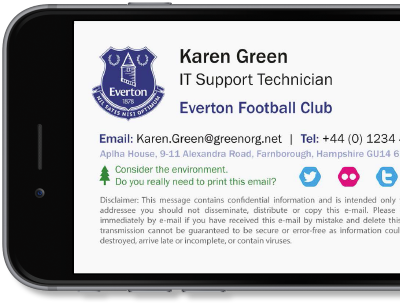 Migrating to Office 365 left Everton Football Club without a way to manage their Office 365 signatures. Enter Exclaimer Cloud - Signatures for Office 365. Everton F.C. (Football Club) is a renowned English football club based in Liverpool that plays in the Premier League, the most watched football league in the world. Starting its history in 1878 as St Domingo’s F.C., a church team created so parishioners of the St Domingo Methodist Church could play sport all year round, Everton F.C was a founding member of the Football League in 1888, which later became the Premier League as it is known today. Based at Goodison Park in Walton, Liverpool since 1892, the club has won nine league titles and five FA Cups over its history and has a well-known sporting rivalry with Liverpool F.C. I would strongly recommend Exclaimer Cloud - Signatures for Office 365 to any business using Office 365. Football clubs like Everton F.C. are instantly recognizable across the globe, carrying with them years of tradition and heritage that cross generational barriers. The sporting crest of any football club is an integral part of its identity, needing to appear on anything relating to said club, from the football kits, club merchandise and official marketing communications. This also relates to the email signatures that are used by its employees. It makes no sense for a club to leave email signature management to every single end user, just as it would not for any other professional organization. Fortunately, Everton F.C. understood the importance of using an email signature manager to protect the club’s “brand” and had been using Exclaimer Signature Manager Exchange Edition for a number of years. However, a recent migration from on-premises Exchange to Office 365 meant that this solution was no longer suitable for the task at hand.